what happens when I am student with no salary? should I go to court personally? If its your first offence you are unlikely to get the actual full whack fine, a colleague of mine got 120 in an 80 (actual police values after the deductions ) and they got 750chf and a 3 month ban where the official book fine would be 20 days salary. You will get a fine but as you have no income itis likely to be their standard base level plus a ban. You wont go to prison dont worry. Just interested given that things got much harsher after January 2013. Does that mean I can get like a discount in penalty from the judge? Your likely to get a fixed penalty of an amount that is feasibly payable by you. Threre is no point having an income fine when you have no income. It will still cost you but don't stress out over possible prison because that's just people scaremongering. Valais, but Vaud dealt with the fine, valais the ban (only in Switzerland..). Don't misunderstand - its still a fine a ban and a strong telling off particularly as its a 30 zone which is normally schools present. But that should be about all. I believe you will also get an official warning, which means that any future speeding offences will be dealt with more harshly. If you had been 1 kph quicker, you would have automatically lost your license for at least one month. so if I have understood well the ban starts from 21kph and I was 20kph more. is that right? Hi all, today I had a situation... was driving on the highway and police which was driving after me stopped me for a speeding. They showed me measured report which says, my speed was from 120 until 164km/h , and there was bolded avarange 142km/h. The policeman told me he need to send the case to the prosecutor and he will decide about "the rest". Does anybody know, how the fines counts, it will be taken in this case from avarange speed measured or from the upper value (164km/h)? Does somebody had similiar situation? I'm wondering how much penalty I can get...I know stupid me. Sorry if it was mentioned it somewhere on this forum already, I was searching but couldn't find. They will use the highest speed, I suspect. And you can expect a three month driving ban and a fine of some hundreds of Francs. All dependent on the courts, both of the canton you were speeding in and of the licence issuing canton if it's not the same. If you don't get a ban then the fine is likely to be higher, well into four figures, I would expect. In theory the fine could be very much higher than that, based on your income, but in my experience it's not often applied. But I've not been _quite_ as much over the limit as that. Oh, and your post appears in a thread with much more useful information about how fines can be calculated, so I suggest you read all the previous posts here too. But I would stress that in my own experience the actual fines levied are very much lower than the maximum possible, which some people here are suggesting. 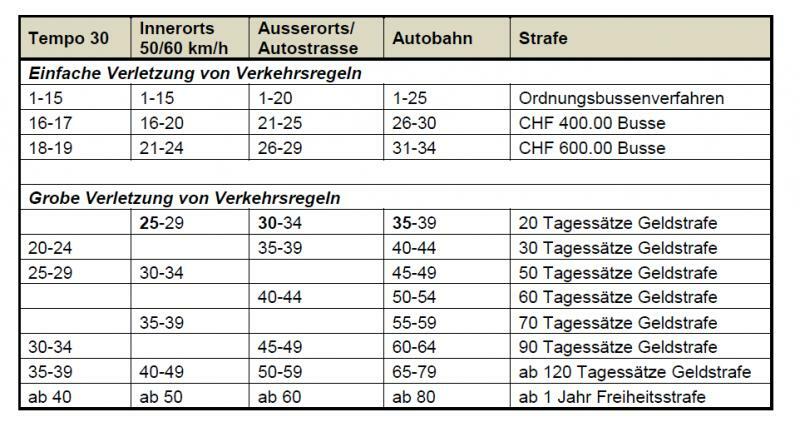 Many years ago I got caught 41 km over - CHF3300 fine (or 26 days in Jail) and a 3 month ban, so be prepared, fines may depend upon your salary, but you can spread them over a number of months, if you ask. You will also probably be driving after the ban on 2 years probation. Learnt my lesson and have had a couple of small speeding fines since, but nothing really to talk about. Here is the breakdown, 5KM may be taken of for the tolerance, you can also choose when you start your ban. was it 164kph with the 7% they have to take off? In the end, you're going to have a vacation from driving, that's for sure. 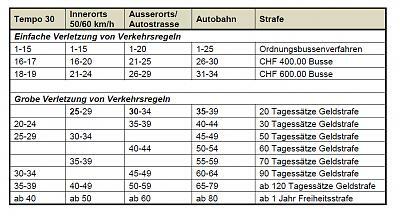 So based on the picture below and calculator from Blick I can expect 20 or 30 "Tagessatze Geldstrafe" (depends if incl speed tolerance or not) and for sure 3 months vacation from driving as Sean Connery said. If I would choose the time slot for the ban that would be better. I forgot you will also have a criminal record and it will take possibly 3-4 months for the paperwork to come through. If I would choose the time slot for the ban that would be better. Get your public transport map soon! You can still ride an electric bike or a moped with pedals. The policeman told me he need to send the case to the prosecutor and he will decide about "the rest". It is average Speed. Verordnung des ASTRA zur Strassenverkehrskontrollverordnung Anhange 1 Tolerance depends on length and type of measurement. It is assumed that the tolerance is already accounted for in your posted average value. But: You mention prosecutor, that indicates an infraction of at least 25 km /h over the limit. Were you speeding in a 100 km/h or a 80 km/h work zone? Or did you additionally tail gate, pass on the right hand side?